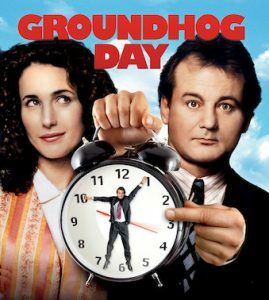 Groundhog Day comes from Candlemas Day, observed for centuries in parts of Europe on February 2 where the custom was to have the clergy bless candles and distribute them to the people. This seems to have derived from the pagan celebration of Imbolc — the Feast of the goddess Bridget, or in Christian Ireland St. Bridget’s Day and alternatively “The Purification of the Virgin” commemorating the time when St. Mary presented Jesus at the Temple at Jerusalem. It comes at the mid-point between the Winter Solstice and the Spring Equinox. The Roman Legions, it is said, originally brought the tradition to the Germans. By the 1840s the following idea caught on in the U.S., particularly in Pennsylvania whose earliest settlers were German immigrants. 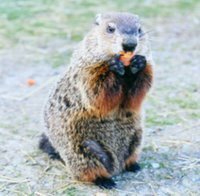 If the groundhog sees its shadow on a “bright and clear” day, six more weeks of winter are ahead. Punxsutawney, Pennsylvania is the headquarters of the celebration where the groundhog “Punxsutawney Phil” regards his shadow at Gobbler’s Knob, a wooded knoll just outside the town. And Bill Murray visited this location (repeatedly) in his movie Groundhog Day. “Our lighted candles are a sign of the divine splendor of the one who comes to expel the dark shadows of evil and to make the whole universe radiant with the brilliance of his eternal light. Our candles also show how bright our souls should be when we go to meet Christ. The light has come and has shone upon a world enveloped in shadows;the Dayspring from on high has visited us and given light to those who lived in darkness. This, then, is our feast, and we join in procession with lighted candles to reveal the light that has shone upon us and the glory that is yet to come to us through him. So let us hasten all together to meet our God. By tradition, Simeon was one of the “70” translators of the accordingly named “Septuagint” translation of the old testament from Hebrew into Greek. He was translating the passage in Isaiah “A virgin shall be with child”, and musing over the fact that the word in Hebrew could either mean virgin or young woman, he almost chose the latter word which appealed to his earthly reason. But an angel appeared to him and stopped him, and told him that “virgin” was indeed the correct translation, and further told him that he would not see death, until the prophecy had been fulfilled. Thus it was that he was waiting in the temple when the 40 days of purification were completed. As always, your comments are insightful and add depth. You’ve taken what most consider to be a secular holiday, and filled in the gaps on its religious background. The legend of St. Simeon at the Temple is a dramatic one. As the Septuagint was translated at least two and a half centuries before Christ, tradition says that he died at the age of 360.